Through A Photographer's Eyes: SHOOT. EDIT. SUBMIT. People's Choice Winner! Ladies and Gentlemen, we have a winner! With 41.33% of the votes, Picking Poppies was selected the overall winner for the month of March! 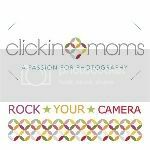 As the winner you will be featured in the sidebar of both blogs (Mom Tried It and Through a Photographer's Eyes) for the month of April. You will also receive a $20 credit to Mod Straps. You will be able to browse around (for what likely will be a long time because they are so awesome) and select a cool new treat for yourself and your camera. My co-host, Kim will be in touch with you soon with information about your prize. Feel free to grab the button below for bragging rights! Thanks so much to everyone! I'm looking forward to "shopping". A gorgeous shot and well deserved win. A very wonderful shot!! Nice with the waterdrops and you've caught an amazing backlight on the rose.